» [NEW GAME] GYROPET RANGER! » [BOLLYWOOD ZONE] Put your Bollywood knowledge to the test with our new Ra.One Quiz! » [New Game] Help Dino complete the words to escape from the Cave of Trap in Hang Machi! Come on and join the biggest party online. Now you don’t all have to be online at the same time to have a fast, fun and social time with other mig33 users. With our new miniblog, you can connect with anyone, anytime, anywhere. Make a bold statement, share what’s on your mind – we’re listening. [New Game] DESA FARM - create and manage your own virtual farm! boss and run your own farm - grow crops, raise animals, craft items, go fishing and even send gifts to friends. Start reaping and sowing your rewards now! Want to earn while chatting in mig33? Then be a merchant! What is the mig33 Merchant Program? Buy discount credits from mig33. Sell credits to other users for a profit. Make Money. Credits are used for cheap international phone calls, SMS, and many other mig33 features. Join thousands of merchants selling credits to millions of mig33 users. Register as a merchant. Through your Local Bank or Western Union, buy discount credits from mig33. Transfer credits to your customerâ€™s account instantly, using your phone. 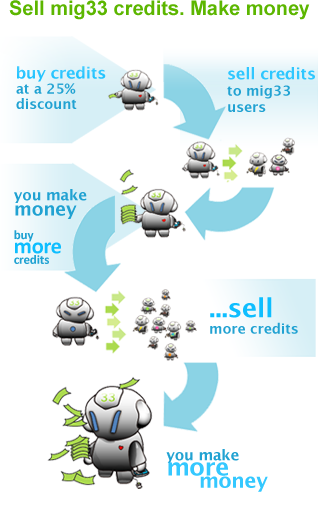 How easy is it to sell credits? mig33 calling rates are cheaper than calling cards, and have no hidden fees. Anyone with a mobile phone can be your customer. Merchants receive free promotion to mig33 users. You decide how to help users find you. When your customer's credit balance runs low, we send them a reminder SMS to buy more from you. The Merchant Center provides detailed step-by-step instructions for easy payment and tools to help you sell. As a merchant, you buy mig33 credits in bulk at a discount rate - and then sell them to other users for a profit. You decide how much you want to charge your customers. You could even turn $150 into $600 in a single month! You must be a mig33 member to register for the merchant program. If you're not a member, join now. After you have joined, you can then register to be a Merchant. Try the mig33 merchant program for as little as USD$5 with a Starter Pack, and get a 10% discount. When you are ready, for any amount over about USD$100 you receive a 25% discount. That's $25 in profit for every $100. Register for the merchant program, and get access to our exclusive Merchant Center Website.